Many of our clients have been attending the Qatar Open Day events in their respective cities. Each month, the Qatar recruitment portal updates the cities around the world that the recruiters will be visiting alongside the hotel venues and times. You are always asked to bring a latest copy of your CV Resume and a passport and full length photograph. Our advice is to ensure you have a good CV that highlights your transferable skills (maximum length: 2 pages) and check your CV for correct grammar usage and spelling errors. 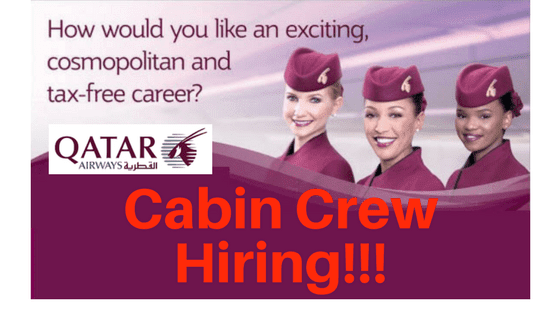 Transferable skills are skills that you have gained from your previous and present jobs that are relevant to the Qatar cabin crew job description. Always highlight this on the first page rather than the second. Ensure you are dressed in formal business attire before taking your formal photographs. Formal business attire means a business suit. Some female candidates think that they should be dressed in just a white top and skirt for the application pictures. This is not the case for pictures to presented at the open day to the recruiters. The instructions on their portal site clearly states that the photographs given to them should be in the same business formal wear as what you would wear for the interview. The latter type of photos in white short sleeve top and skirt and a blue background are for those that pass the final interview. Turn up early, often this is 8 or 9 am at most venues. It is best to turn up early. The event will be held in a conference room at the hotel and two or more recruiters will meet each applicant informally in a separate room when they hand over their CV. The recruiters will read and review your CV and will often ask you a couple of short questions. If you pass this stage, you will get a note to inform you that you have been invited to the Assessment Day which in most cases takes place in the afternoon. You are asked to keep this note / piece of paper to yourself and not show to others. For those who do not get this, they are told they will receive an email by the end of the day but often they don't. So, what are the short questions that you may get asked when handing over your CV? 2. Why do you want to be a cabin crew? 3. Why do you want to work for Qatar? Be prepared to present these answers as they relate to your own skillset and experience. Rehearsing these answers and presenting them well is very important to get you to the next stage. At the very first stage, you are assessed on your CV quality, interpersonal and presentation and listening skills, your overall professional appearance and business attire. Of course, the quality of the answers you provide to the short questions are just as important.